It is February. We live in New Hampshire. It is often cold and stormy! Looking back on the weather of 1817-17 and 1917-18, we seem to be having an old-fashioned New England winter with more cold and snow in the forecast. It is hard to imagine how daily life would be without the the modern conveniences of 2017—car seat warmers; high tech clothing; snow removal crews keeping our streets safe; and sophisticated heating systems in our homes. In comparison to the "good old days," we have it pretty good in the 21st Century. Speaking of wintry storms, I would like to thank all the intrepid souls who ventured out for the Historical Society’s Thursday’s Child dinner at the New London Inn that snowy evening of February 9, and the same for the great group of people who enjoyed the Dessert Social at Tracy Library the night before. During these winter months, the Board of Directors and staff of NLHS are busy pulling together programs and planning events for the upcoming months. Be sure to look at the calendar in the right hand column of this newsletter and add the dates to your own personal calendar. Judging by the weather, we can look forward to a good maple syrup harvest this month and prepare for the inevitable mud season that is sure to come after all snow and deep frost are gone. Meanwhile, stay warm and safe. 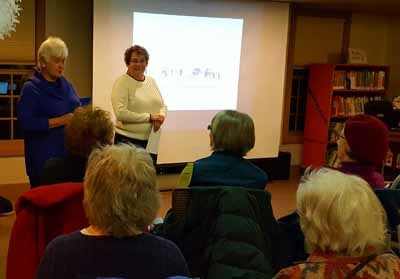 The Dessert Social, "Mrs. Jane Tracy Abroad," on Wednesday, February 8 at the Tracy Memorial Library attracted a large audience of over 50 people. Maureen Strachan and Sandy Schmid introduce the Dessert Social program. It was great relief from the winter doldrums. The program committee served delicious treats and introduced an informative program presented by Jim Perkins, New London Town Archivist. Thanks to the library for use of the meeting room, Jim for the program, all the attendees and the NLHS board members and dynamic duo Sandy Schmid and Clara Sheehy for pulling all this together. A hearty group of supporters of the New London and Sunapee historical societies enjoyed a lovely evening and delicious dinner in the Coach House Restaurant at the historic New London Inn in spite of the winter storm on February 9. 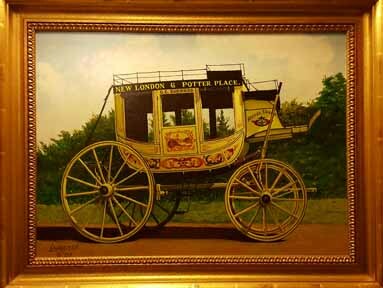 It's always a treat to see the Bud Lauridsen painting of the Concord Coach in the lobby of the Inn where guests were greeted by a roaring fire in the open hearth. The setting was cozy and everyone enjoyed the chance to visit and dine. Thank you to all who attended the dinner and to our friends at the Coach House Restaurant for including NLHS as a participant in their program. 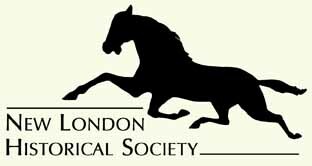 The New London Historical Society Business Partner Membership enrollment for 2017 opened in January. Partnering with the NLHS makes good sense for area businesses, professionals, and corporations. 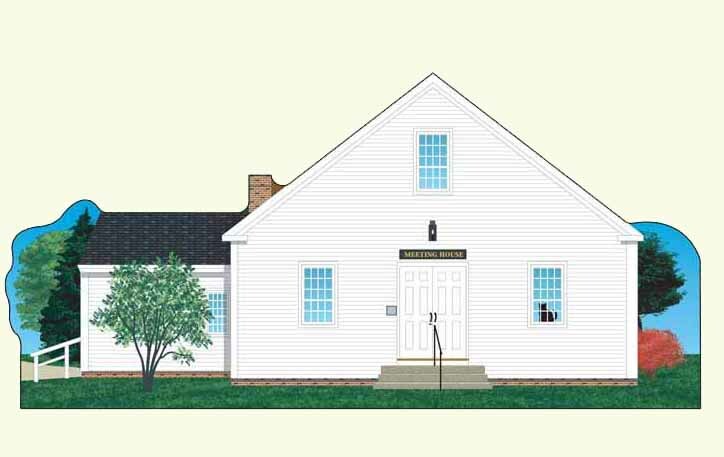 Not only do you support the Historical Society, you demonstrate your support for the greater New London community and its culture. There are four different levels, ranging from $100 to $1000, that include wide promotion of your membership, valuable transferable event tickets, and regular NLHS memberships. 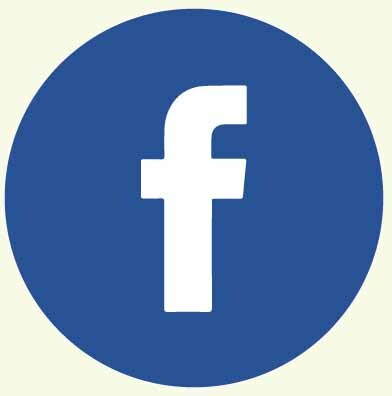 Various other perks include free rental opportunities and private tours of the Village and museum. 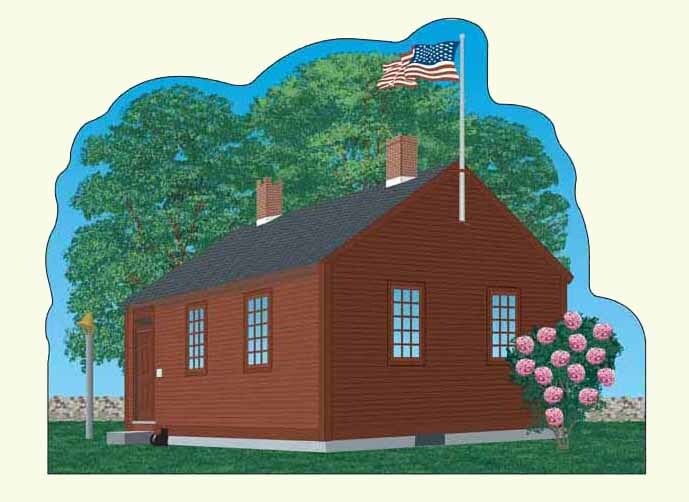 The New London Historical Society is thrilled to give students (grades K–12) a chance to show off their creative side. Young artists are invited to exhibit their work, and judges will award CASH prizes in each age group. Contestants may submit a single work of art in one of the following media: drawing, painting, 3D/mixed media, or photography. A new award category this year will be "NLHS Village in Art." A student may choose a building or an artifact within the Village to use as a subject for his or her entry. Registration packets will be available from: the Historical Society website; art teachers in the local schools; and independent art teachers and mentors in the area. Young at Art in 2017 with a twist! This year in addition to the traditional art show, Spring into Art, a creative camp to help young artists work on their entries will be held during April vacation. The workshops are tentatively scheduled for the mornings of Tuesday April 25 and Thursday April 27. Watch the New London Historical Society website for more details. Back by popular demand the Hands-on History Camp will be offered again in 2017. 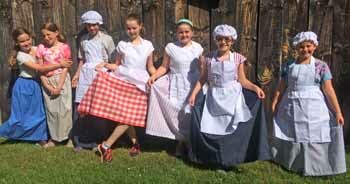 The theme is “exploring local history that shows life in the 1800s in New England.” Campers actively engage in working at the forge with our blacksmith as well as spinning, rug hooking, and hearthside cooking. 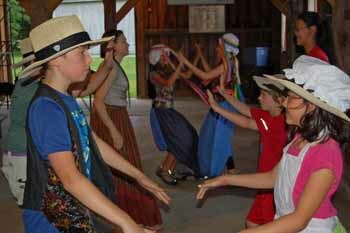 Contra dancing, singing, and outdoor games that were so popular last summer will be also be part of the program. Applications and information will soon be available on our website. This is a wonderful opportunity for grandparents to provide visiting grandchildren with hands-on activities. Scheduled for the weeks of July 10 and July 17, you may choose a one-week or two-week adventure. 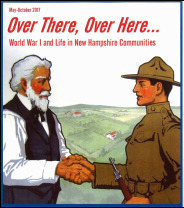 The MUSE (MUseums Sharing Experiences) group is currently planning a multi-organization exhibition for 2017, Over There, Over Here: World War I and Life in N.H. Communities. It will feature exhibits, programs, lectures, book readings and activities. Some of the themes the exhibition will cover are temperance, women’s suffrage, the Spanish Influenza epidemic, code talkers, camouflage, communication, art, literature, and the home front. 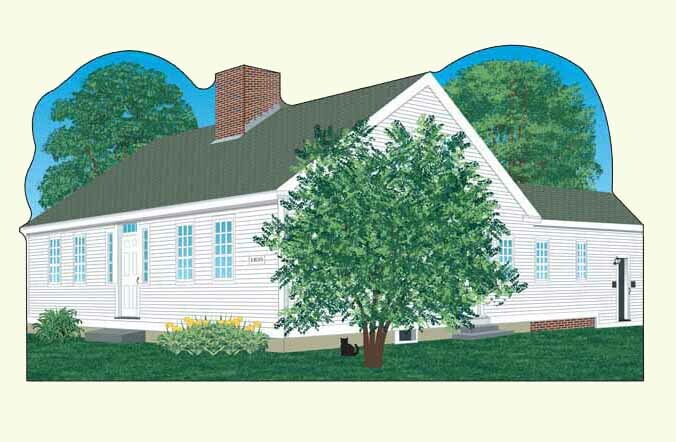 This year's goal is to raise $35,000 for a new historically authentic roof for the Scytheville House, and we are sooooo close! Through generous donations from over 110 individuals including a grant from the Charitable Foundation, we are at 70% of our $35,000 goal. And recently, at the request of the family of Jack Hambley, all memorial gifts directed to the NLHS in his name are being directed to the Raise the Roof fund. 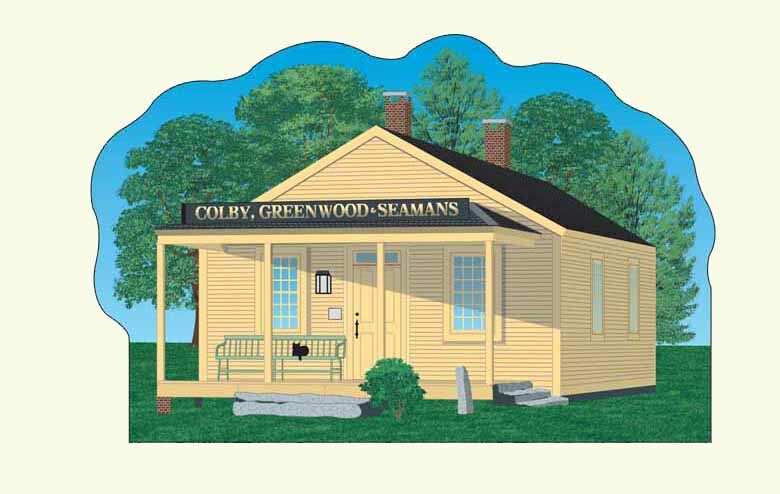 Every donation, like every cedar shake, helps to ensure the preservation of our community history. 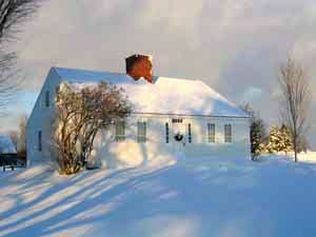 Built in Elkins in 1835, the Scytheville House now has a prominent position at the entry of the Village. It has literally become the hearth and home of the New London Historical Village. Copyright © 2017 New London Historical Society, All rights reserved.